If you want to have a killer look this year, then you better buy yourself one of these long skirts. I am so in love with long, sleek skirts. This style is known from the mid 1960's and 1970's, when hippies 'ruled' the world. There are fantastic brightly colored, printed and neutral designs ideal for making statement walks in the streets of big cities. The following post will guide you through some of the best ways for wearing and embellishing this marvelous garment. 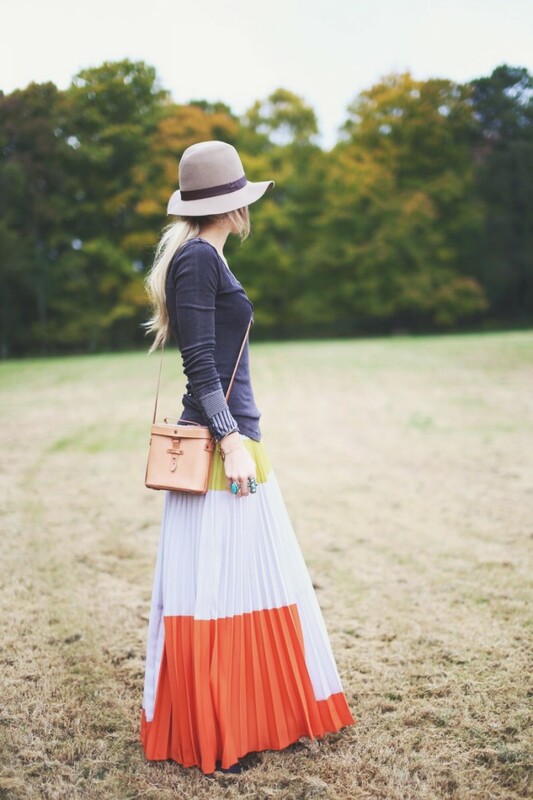 Pale orange pullover ideally fits emerald green maxi skirt with high-slit. Complete the look by adding statement black sunglasses, white trainers and pale blue shoulder bucket bag. Those of you who have problems in the tommy area will for sure wear long skirts all day and night long. High-waisted maxi skirt manages to disguise a rounded tommy, so you look trendy and skinny. Personally, I had problems with my shape 2 years ago and I was wearing exactly long bottoms to hide my belly. You can add smart-casual button-down shirt to completely camouflage problem area. Speaking of great pairings, then I would love to underline short tunics, long shirts and blouses worn over the skirt. But make sure the shirt is not too long, otherwise there will be an illusion of you wearing double skirts. Those of you who wants to achieve more fashionable look, then I recommend to add a slouchy tank and strappy heels, so you can look like a real diva star. Of course, once the skirt ideally fits you, then there can be limitless options adding cool tops and toppers. Keep in mind about the right length of the skirt by choosing the one that is in direct accordance with your height. This is an essential piece what should be in every woman's wardrobe. Today, we are lucky to wear slinky designs with thigh-high slits and high-rise styles. As you have already understood, the options are pretty much endless. We better take a close up look at my favorite 15 looks. Let me know your thoughts in the comments below. Where can I purchase the Fringed brown leather handbag?